UConn President Susan Herbst, who has led the university since 2011, announced today that she will step down next summer when her current employment agreement concludes and she will have completed eight years of service to UConn as its president. “Being able to lead this outstanding institution has been one of the great honors and privileges of my life,” she said in a message to the UConn community. “These have been exciting and rewarding years. UConn has continued to rise in the rankings and grow academically as we embarked on transformational new initiatives, formed vital partnerships, addressed long-standing needs, planned carefully for the future, and made difficult but necessary decisions. Herbst was named UConn’s 15th president on December 20, 2010 and is the first female to hold the position since the school was founded in 1881. Her appointment was supported by both outgoing Republican Gov. M. Jodi Rell and incoming Democratic Gov. Dannel P. Malloy. 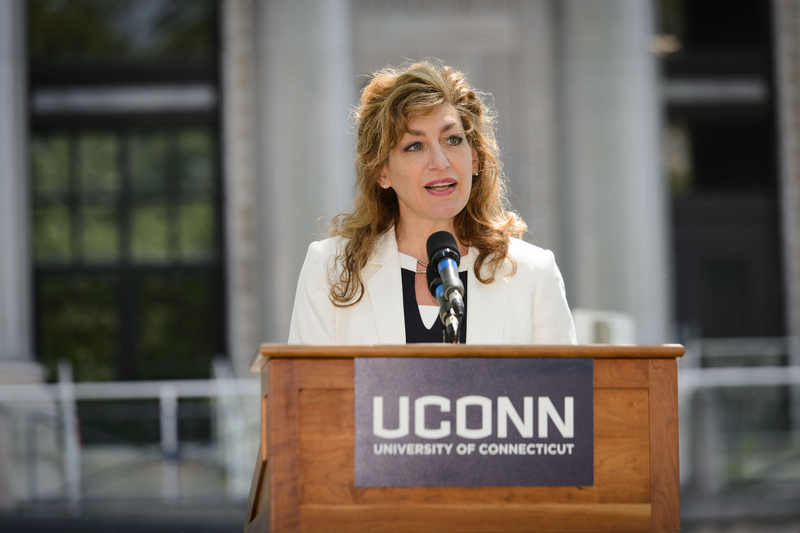 As president, Herbst led the implementation of major state investments in UConn: Bioscience Connecticut and Next Generation Connecticut, both of which were approved by the Connecticut state legislature with bipartisan support and signed into law by Gov. Malloy in 2011 and 2013, respectively. Bioscience Connecticut is an $864 million initiative at UConn Health which allowed for expanded enrollment in the medical and dental schools, building new space for business incubators, creating centers of excellence with neighboring institutions, and more. The initiative transformed the campus and included building a new world-class hospital tower, an outpatient ambulatory care center, and parking garages. Existing facilities underwent major renovations, making room for updated infrastructure, state-of-the-art research laboratories, and modern educational spaces. Through Bioscience Connecticut, business incubator space at the university doubled. Bioscience Connecticut was critical to attracting The Jackson Laboratory to create a new billion-dollar personalized medicine laboratory on the UConn Health campus in Farmington as part of a new partnership with the university that was approved in 2012. Next Generation Connecticut is a more than $1.5 billion initiative that has expanded educational opportunities, research, and innovation in the science, technology, engineering, and math (STEM) disciplines at UConn, as well as added new faculty in the humanities. NextGen funded the construction of the new 727-bed Werth residence hall, the new Engineering and Science Building, massive infrastructure improvements, and will fund the renovation of the Gant Science Complex, among other projects. In the fall of 2012, Herbst announced that UConn would relocate its Greater Hartford campus from suburban West Hartford to downtown Hartford. The new Hartford campus opened in the fall of 2017, incorporating the façade of the former Hartford Times newspaper building. The campus is home to more than 2,300 students, faculty, and staff. The university also worked with Barnes & Noble to open the campus bookstore and coffee shop across from the UConn campus on Front Street – it is the only major bookstore in the city of Hartford, and an example of Herbst’s often-stated commitment to making the campus a part of the city’s business and social fabric. In Stamford, Herbst established a new student residence hall near the main campus building that houses 300 students. It is the only UConn regional campus to have student housing. Enrollment in both regional campuses continues to climb. Herbst has also tackled difficult but necessary structural changes during her time as president, including recommending to the board that it close the small and undersubscribed Torrington regional campus, which it did in 2017. She also worked to stabilize UConn Health’s fiscal condition. The university is currently laying the groundwork for a potential public-private partnership for its clinical operations which, if successful, will set UConn Health on a new path, help address its longstanding fiscal issues, and strengthen the medical and dental schools and biomedical research conducted on the campus. In addition, UConn’s Innovation Partnership Building opened in the Storrs campus during her presidency. It is the university’s “premier center for cutting-edge research and industry collaboration and innovation” though cross-disciplinary research teams that develop novel approaches to critical real-world problems in fields ranging from manufacturing to biomedical devices to cybersecurity. The IPB strengthens Connecticut’s economic future by connecting leading industries with outstanding research facilities and fosters new, innovative partnerships with entrepreneurs and with companies of all sizes. Herbst also created a four-year plan, approved by the university’s board of trustees in December 2011, to hire 300 new tenured or tenure-track faculty members at UConn – above and beyond filling vacancies – to significantly enhance course offerings and the university’s research capability. The initiative resulted in new faculty hires across multiple disciplines, including both the sciences and the humanities, building on existing faculty strengths as well as investing in emerging fields. This expanded course availability makes it easier for students to take the classes they need, when they need them, to help them graduate on time. She and Athletic Director David Benedict rehired Randy Edsall and UConn’s head football coach and recently hired Dan Hurley as UConn’s new men’s basketball coach. Herbst’s time at UConn has also included a strong focus on affordability and providing an exceptional student experience on its campuses. With strong support from the undergraduate student body, for instance, Herbst initiated the construction of a new $100 million student recreation facility that is under construction now. It will replace the small and inadequate 1950s-era student recreation facility that struggles to serve the Storrs campus student population. The new student recreation center will open next summer. Herbst also recommended that the board eliminate several student fees at UConn, including fees for individual courses and specific majors. 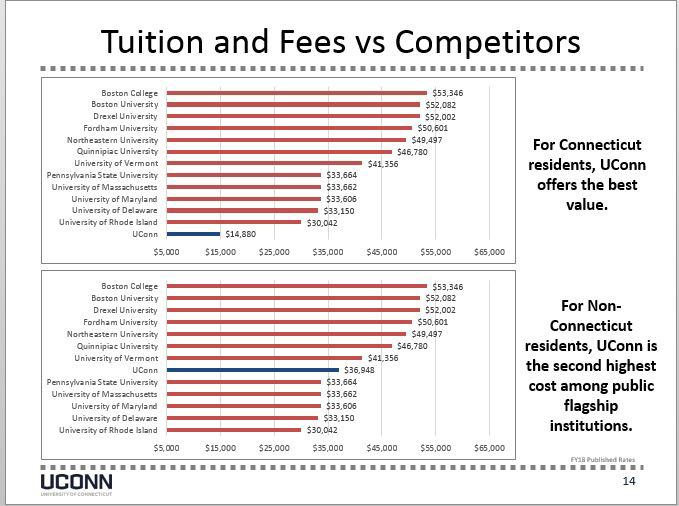 The board approved the elimination of the fees earlier this year, effectively reducing fees for about 10,000 UConn students. She led the successful effort to combine the old UConn Alumni Association with the UConn Foundation, creating a single non-profit entity to oversee both philanthropy and alumni relations – a common model in higher education. Herbst facilitated Barnes & Noble becoming the university’s bookstore provider, resulting in an additional $4.25 million in revenue that was devoted to student financial aid in the first year alone, with millions more ahead in coming years. The Storrs campus location also underwent a dramatic renovation. Since fiscal year 2010, UConn and UConn Health have had to contend with $164 million in state cuts, rescissions, and fund sweeps as Connecticut has grappled with budget deficits. In response, Herbst implemented millions in cuts and efficiencies in effort to protect UConn’s academic core and patient care. Under Herbst’s leadership, the university also produced a new strategic academic plan and its first comprehensive Campus Master Plan for facilities, transportation, and conservation, among other areas. In 2010, the year before she arrived, UConn was ranked 26th among public research universities in the nation by U.S. News. Since then, UConn has risen to become the 18th best public university in the nation – out of 132 institutions nationwide. Freshmen applications to attend UConn also continued to skyrocket: In 2010, the university received 23,278 freshmen applications; by 2018, the number exceeded 37,000. The average SAT score for Storrs campus freshmen in the fall of 2010 was 1221; by 2017, it had risen to 1294. The number of Storrs freshmen graduating in the top 10 percent of their high school classes was 44 percent in 2010; by the fall of 2017, it had risen to 54 percent. In the fall of 2010, 110 high school valedictorians and salutatorians came to UConn; in the fall of 2017, it was 161. Incoming classes also became more diverse: 35 percent of the most recent freshman class came from minority backgrounds, not including international students. In 2010, the Storrs campus was home to 17,345 undergraduates; by the fall of 2017, that number reached 19,241, an increase of nearly 11 percent. UConn also began producing more graduates: In 2010, UConn conferred 7,046 undergraduate and graduate degrees. This year, more than 9,036 degrees were conferred – an increase of 28 percent. Most UConn graduates go on to live and work in Connecticut. The faculty also grew: In the fall of 2010, UConn was home to 1,347 faculty members; by the fall of 2017, it had risen to nearly 1,600. Expanding the School of Engineering was one of Herbst’s major goals. In 2010, the school’s total enrollment – both graduate and undergraduate – was 2,643. In the fall of 2017, the total enrollment had swelled to 4,170 – an increase of more than 57 percent. Women are significantly underrepresented in engineering programs nationwide, and UConn has made a concerted effort to expand the number of female students at the university majoring in engineering. In 2010, 518 of the school’s students were female –by the fall of 2017, this number had more than doubled to 1,037. “Susan Herbst has been a tremendously effective leader for this university,” UConn Board Chairman Thomas Kruger said. “Her relentless pursuit of academic excellence and institutional quality has made an extraordinary difference at UConn, and she will leave an incredibly positive legacy. Lawrence D. McHugh served as board chair from 2009 through 2017 and worked closely with Herbst throughout her tenure. “Susan has been one of the best presidents in the university’s history and hiring her is one of the most important and far-reaching decisions we made as a board,” said McHugh. “Her contributions have been powerful and lasting. She led the place with a fierce determination to drive UConn higher and higher academically, to expand the faculty, focus on student success, build outstanding facilities, and to do all she could to ensure UConn grew and thrived. At eight years, Herbst will have had one of the lengthier tenures as UConn’s president. Only four presidents have served longer: Charles L. Beach (1908-1928), Albert Jorgensen (1935-1962), Homer Babbidge (1962-1972) and Philip Austin (1996-2007). Herbst’s original five-year employment agreement was extended by the board in 2014 to run through 2019. It will expire on July 1 of that year. Herbst began her career as a professor at Northwestern University, where she was on the faculty from 1989 until 2003, when she became dean of the College of Liberal Arts at Temple University. She went on to become Provost at SUNY-Albany and later the Executive Vice Chancellor & Chief Academic Officer for The University System of Georgia before coming to UConn. She is a scholar of public opinion, media, and American politics, and is the author of four books and numerous articles in these fields. When she was appointed to be the president at UConn, she was simultaneously appointed as a professor of political science at the university. She will return to teaching and scholarly activities as a faculty member on UConn’s Stamford campus. Kruger said he would appoint a broad-based committee this summer to begin the national search for UConn’s 16th president. The committee will include faculty, staff, students, alumni, and trustees. Kruger will serve as its chair. The search will be managed by Rachel Rubin, the university’s Chief of Staff and Executive Secretary to the Board, and Michael Kirk, the Deputy Chief of Staff. Kruger said he expects that a pool of candidates will be built over the summer months, initial interviews will take place in the fall, and finalists will be selected and interviewed late in the fall 2018 semester. A final candidate will be selected at the end of calendar year 2018, or early 2019, to begin next summer after Herbst steps down. The full board must vote to select a new president. The governor of Connecticut is the ex-officio head of the Board of Trustees. Based on this timeline, the board would seek the support of both the outgoing and incoming governor, as it did in 2010.